TNUSRB Constable Recruitment 2019 – Tamil Nadu Uniformed Services Recruitment Board (TNUSRB) has released the application form of TN Constable Recruitment 2019 at tnusrbonline.org. The application form are activated on March 08, 2019 fro 10:00 AM onwards. The Board is inviting the application form for 8826 vacancies for the post of Police Constable, Jail Warder, and Fireman. 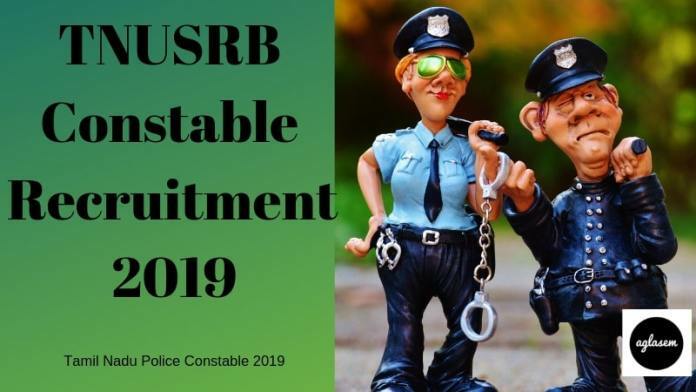 The candidates can apply for the TNUSRB Constable Recruitment 2019 until April 08, 2019. The candidates who have completed 10th and are in the age group of 18 to 24 years can apply. From this page, candidates will get full information regarding TNUSRB Constable Recruitment 2019. Latest: TNUSRB Constable Application Form 2019 has been released. Scroll down to apply. TNUSRB Constable Recruitment 2019 will be done the basis of Written Examination, Physical Measurement Test (PMT), Endurance Test (ET), Physical Efficiency Test (PET), Interview and Medical Test. For more information regarding Tamil Nadu Police Constable Recruitment 2019 check the schedule given below. In the form, candidates should fill the valid details. In the application form, candidates need to fill personal, contact, education, qualification, exam center details and have to upload the scanned photograph and signature. The candidates who will submit the for on-time those form will be only taken into the consideration for the further recruitment process. Mode of Payment: Candidates can make the payment by using two-mode i.e. online or offline. Online Mode: The candidates who want to make online payment can so it so by using Credit card, debit card, internet banking etc. Offline Payment: The candidates using offline payment gateway can make the payment by depositing the cash in the Stae bank of India (SBI) through SBI E- Challan. The Tamil Nadu Police Constable Recruitment 2019 will be done for total 8826 vacancies. The recruitment will be done for hiring the candidates to Police Constable, Jail Warder, and Fireman posts. From below candidates can check the vacancy details of Tamil Nadu Police Constable Recruitment 2019. Before filling the application form candidates first should the eligibility criteria. If the candidates found ineligible at any stages if the recruitment process then he / she will be not considered for the further process. Check the detailed eligibility criteria of TNUSRB Police Constable Recruitment 2019 from below. Educational Qualification: Candidates should have qualified 10th standard with Tamil Language subject. 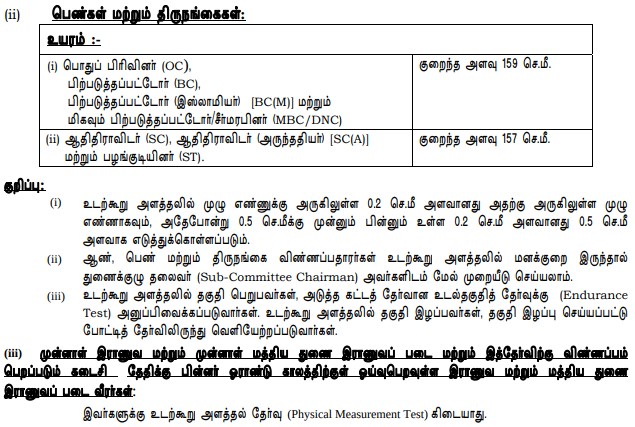 Note: The board will provide preference to those candidates who have qualified 10th standard from Tamil Medium School. These candidates will be given 20% preference. The candidates who will submit the form before or till the last date for those only admit card will be issued. The TNUSRB Police Constable Admit Card 2019 admit card will be released at the official website. First, the admit card for written examination will be released. For each stage of the examination, separate admit card will be released. Admit Card will be containing the name of the candidates, Roll Number, Exam Center Name, Center Code, Father’s Name, Timing of examination etc. It will be mandatory for all the candidates to carry a hard copy of the admit card and one valid photo id proof (adhaar card, pan card, voter od card, passport etc) on the day of the TNUSRB Police Constable Examination 2019. Candidates should know about the exam pattern from this candidates git know about the exam mode, duration, subject name, marks etc. Check the detailed exam pattern of TNUSRB Constable Recruitment 2019 from below. Men: 1500 meters run within 07 minutes. Women: 400 meters run within 02 minutes & 30 seconds. For the candidate’s first written examination will be conducted. The candidates who will qualify the written examination those will be selected for the Physical Measurement Test (PMT). Qualifiers of the PMT will be shortlisted for the Endurance Test. The candidates will qualify the ET those will be called for Physical Efficiency Test (PET). The candidates who qualify the PET those will be called for the Interview round. Qualifiers of the Interview round will be called for final round i.e. Medical Test. The candidates who will qualify all the stages of the recruitment process those will be finally selected for the applied post. Original Certificate Verification process for document verification will be also conducted by the board. On that day candidates have to carry the original 10th and 12th mark sheet, Discharge certificate, Category Certificate (if applicable), Ex-Servicemen Certificate (if applicable), Qualification Certificate etc. The candidates who will fail to show up the documents those will be not considered for the further process. After each stage of the test, separate result for that test will be declared by the board. The TNUSRB Constable Result 2019 will be declared on the official website. At first, the written examination result will be declared. The result will be based on the performance of the candidates. After the declaration of each test result, the final selection list in the form of merit list will be declared. The candidates whose name and roll number will be there in the final selection list those will be selected for the applied post. The candidates who will be hired for the applied post those will be given the basic pay of Rs. 18200 to 52900 per month. Along with salary, other dearness allowances will be also given to the recruited candidates. For more Information regarding TNUSRB Constable Recruitment 2019 Download Advertisement.